The Great Recession that began in December 2007 was so long and severe, and the government response so inadequate, that the crater it left in the labor market continues to be devastating for workers of all ages. The U.S. labor market still has a deficit of nearly 9 million jobs, and the unemployment rate has been at 7.6 percent or higher for more than four years. (In comparison, the highest unemployment rate in the two recessions prior to the Great Recession was 7.8 percent, for one month in the early 1990s downturn.) The weak labor market has been, and continues to be, very tough on young workers: At 16.2 percent, the March 2013 unemployment rate of workers under age 25 was slightly over twice as high as the national average. Though the labor market is now headed in the right direction, it is improving very slowly, and the prospects for young high school and college graduates remain dim. Unemployment among young graduates is extremely high today not because of something unique about the Great Recession that has affected young people in particular, but because young workers always experience disproportionate increases in unemployment during downturns. The Great Recession and its aftermath has been the longest, most severe period of economic weakness this country has experienced in more than seven decades. The large increase since 2007 in the unemployment and underemployment rate of young college graduates, and in the share of employed young college graduates working in jobs that do not require a college degree, underscores that today’s unemployment crisis among young workers did not arise because these young adults lack the right education or skills. Rather, it stems from weak demand for goods and services, which makes it unnecessary for employers to significantly ramp up hiring. 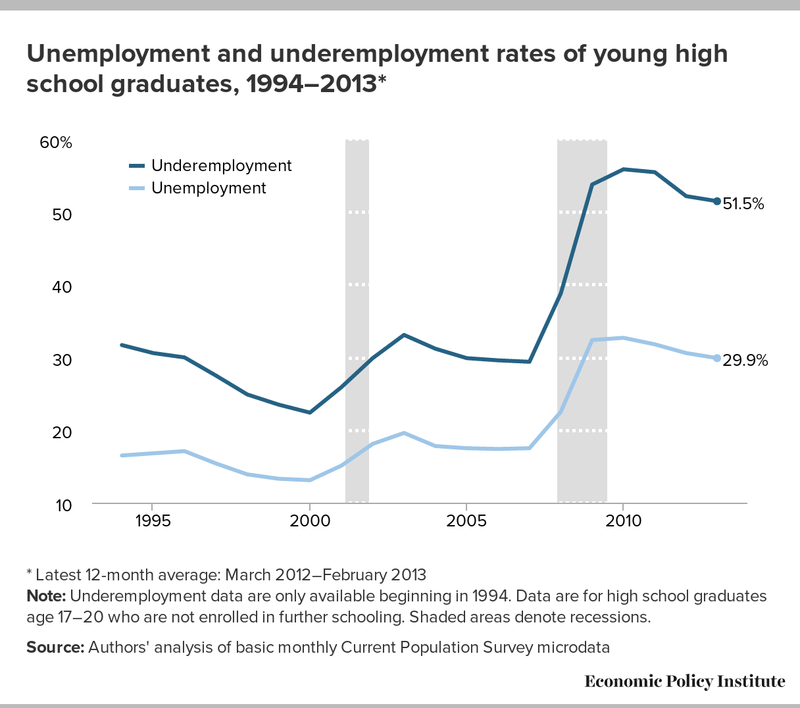 Unemployment and underemployment rates of most young graduates have only modestly improved since last year, and rates among all graduates are substantially higher than before the recession began. For young high school graduates, the unemployment rate is 29.9 percent (compared with 17.5 percent in 2007) and the underemployment rate is 51.5 percent (compared with 29.4 percent in 2007). For young college graduates, the unemployment rate is 8.8 percent (compared with 5.7 percent in 2007) and the underemployment rate is 18.3 percent (compared with 9.9 percent in 2007). There is no evidence that young adults have been able to “shelter in school” from the labor market effects of the Great Recession; college and university enrollment rates of both men and women have not meaningfully departed from their long-term trend since the start of the Great Recession. 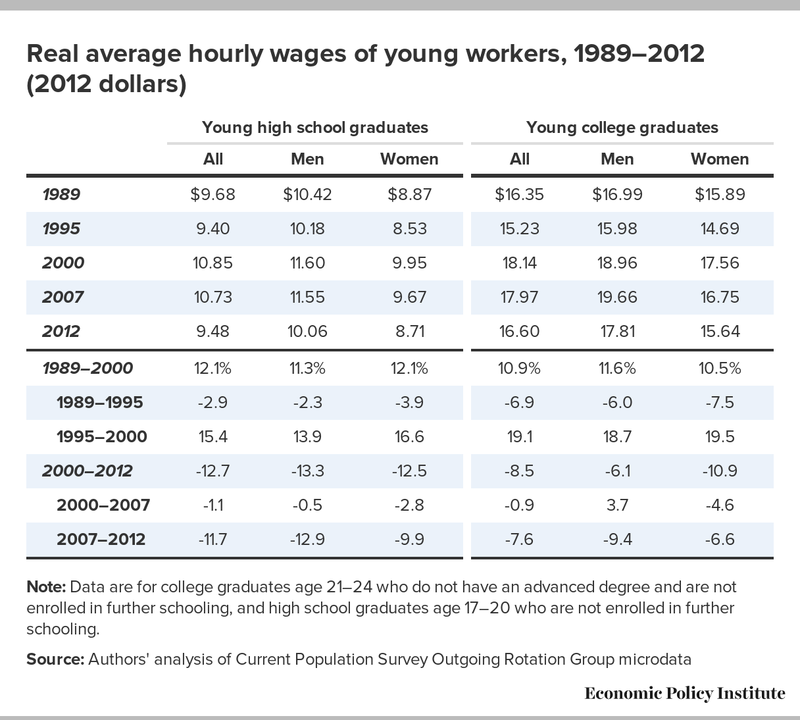 The long-run wage trends for young graduates are bleak, with wages substantially lower today than in 2000. Between 2000 and 2012, the real (inflation-adjusted) wages of young high school graduates declined 12.7 percent, and the real wages of young college graduates declined 8.5 percent. The erosion of job quality for young graduates is also evident in their declining likelihood of receiving employer-provided health insurance or pensions. 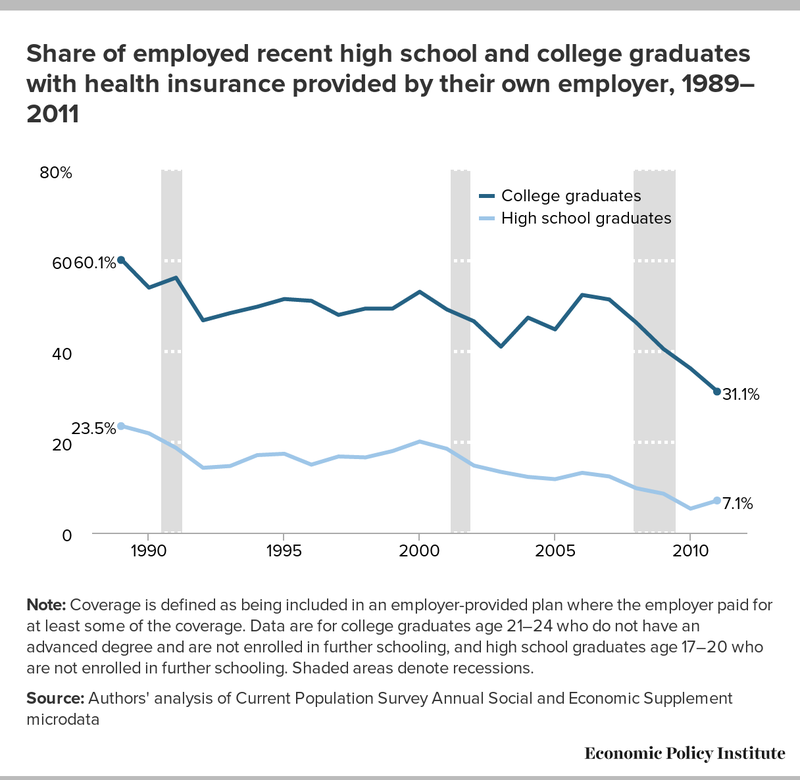 Between 1989 and 2011, the share of employed young high school graduates who receive health insurance from their own employer dropped from 23.5 percent to 7.1 percent. Over the same period, the share of employed young college graduates who receive health insurance from their own employer dropped from 60.1 percent to 31.1 percent. 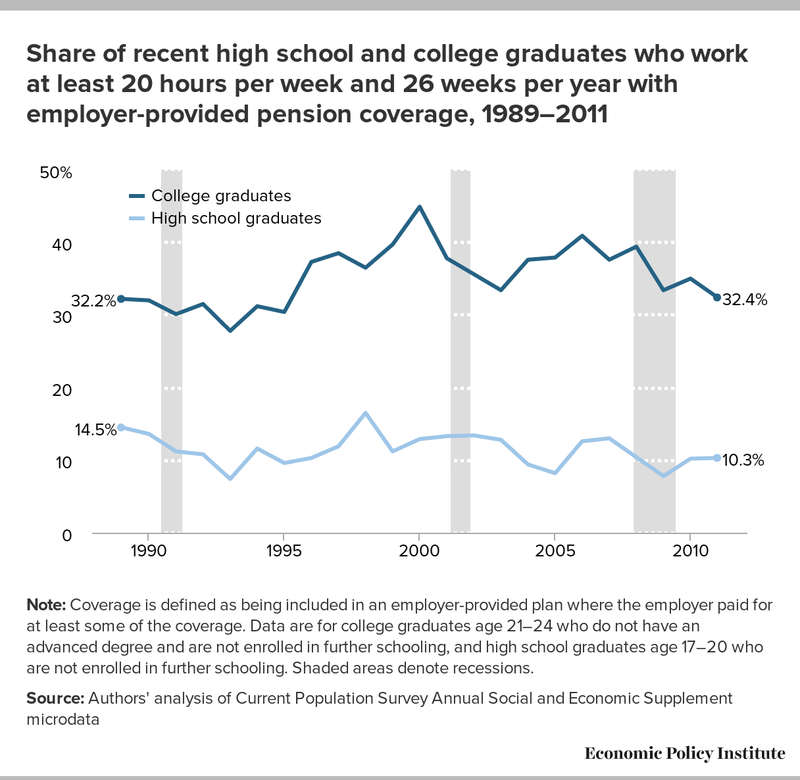 Between 2000 and 2011, the share of employed young high school graduates who receive pension coverage from their employer dropped from 9.7 percent to 5.9 percent. Over the same period, the share of employed young college graduates who receive pension coverage from their employer dropped from 41.5 percent to 27.2 percent. Young graduates with jobs lack opportunities for advancement, a trend underscored by the fact that there are now more than 20 percent fewer total voluntary quits each month than there were each month in 2007. 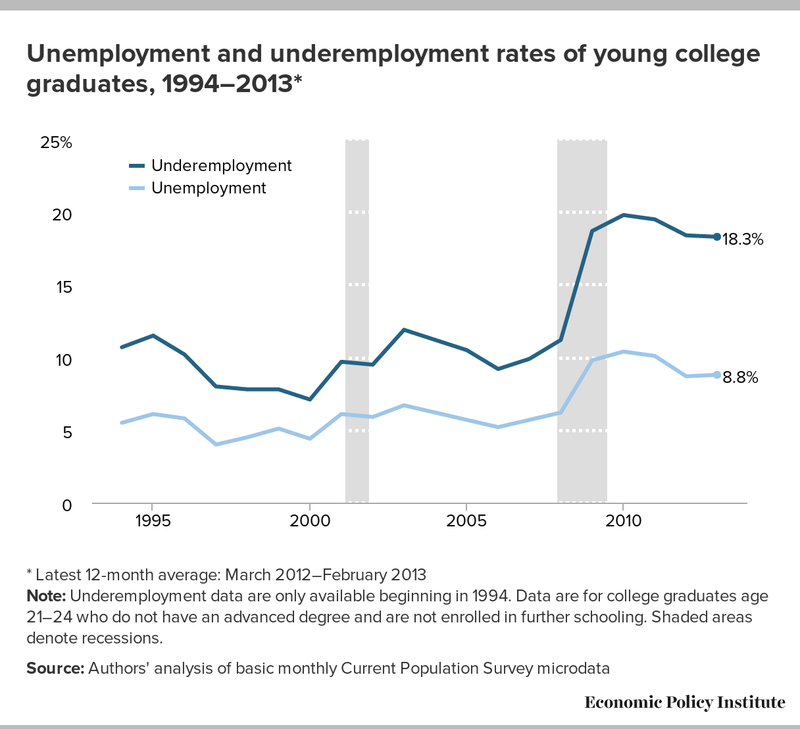 Graduating in a bad economy has long-lasting economic consequences. For the next 10 to 15 years, those in the Class of 2013 will likely earn less than if they had graduated when job opportunities were plentiful. The safety net of federal and state assistance programs often does not cover young workers due to eligibility requirements such as significant prior work experience. The cost of higher education has grown far more rapidly than median family income, leaving students with little choice but to take out loans which, upon graduating into a labor market with limited job opportunities, they may not have the funds to repay. The scarcity of job opportunities for the Class of 2013 is a symptom of weak demand for workers more broadly. What will bring down young workers’ unemployment rates most quickly and effectively are policies that will generate strong job growth overall, such as fiscal relief to states, substantial additional investment in infrastructure, expanded safety net measures, and direct job creation programs in communities particularly hard-hit by unemployment. In economic recessions as well as expansions, the unemployment rate of young workers (those under age 25) is typically around twice as high as the overall unemployment rate (see Figure A for national data and Appendix Table A1 for state-level data). This trend persists over time because young workers are relatively new to the labor market—often looking for their first or second job—and they may be passed over in hiring decisions due to lack of experience. As for young workers who are already employed, their lack of seniority makes them likely candidates for being laid off when their firm falls on hard times or is restructuring. Young workers also tend to be more mobile than older workers, moving between jobs, employers, careers, or even cities, and thus spend a larger share of their time as job seekers. The historical fact that the unemployment rate of young workers tends to be around twice the overall rate continues to be true today. In 2012, the overall unemployment rate averaged 8.1 percent, and the unemployment rate of workers under age 25, at 16.2 percent, was exactly twice as high. This raises two key points. First, because the unemployment rate of young workers is typically around twice as high as the overall rate, young workers experience much greater-than-average increases in unemployment during economic downturns. When the overall unemployment rate is elevated by 1 percentage point, the unemployment rate of young workers will likely be elevated by around 2 percentage points. Second, the dire situation young workers face today is not unexpected given overall labor market weakness. In other words, unemployment of young workers is extremely high not because of something unique about the Great Recession and its aftermath that has affected young people in particular. Rather, it is high because young workers always experience disproportionate increases in unemployment during downturns—and the Great Recession and its aftermath is the longest, most severe period of economic weakness in more than seven decades. Note: Data are for high school graduates age 17–20 who are not enrolled in further schooling. Shaded areas denote recessions. As Figure B shows, the unemployment rate of young high school graduates jumped from 17.5 percent in 2007 to 32.7 percent in 2010, dwarfing the increases in prior recessions. The rate has since declined slightly, to an average of 29.9 percent over the last year (March 2012–February 2013). The increase between 2007 and 2010 was particularly pronounced for young male high school graduates, from 18.7 percent to 35.0 percent. Men’s unemployment rates tend to disproportionately increase during downturns in large part because men are more concentrated in industries particularly hard-hit by recessions, such as manufacturing, construction, and transportation. 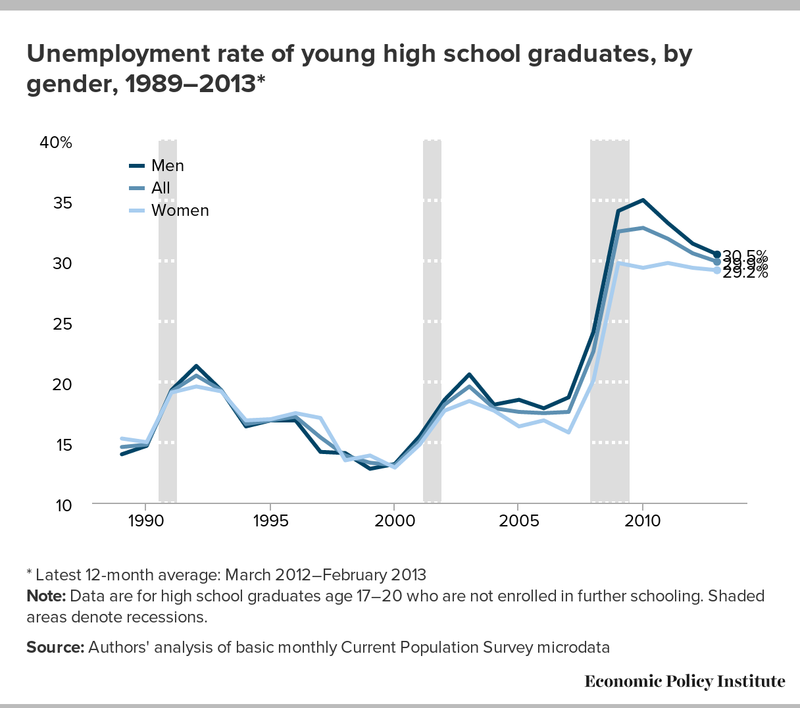 Since 2010, unemployment rates by gender for young high school graduates have become more equal; from March 2012 to February 2013, the unemployment rate averaged 30.5 percent for young male high school graduates and 29.2 percent for young female high school graduates. 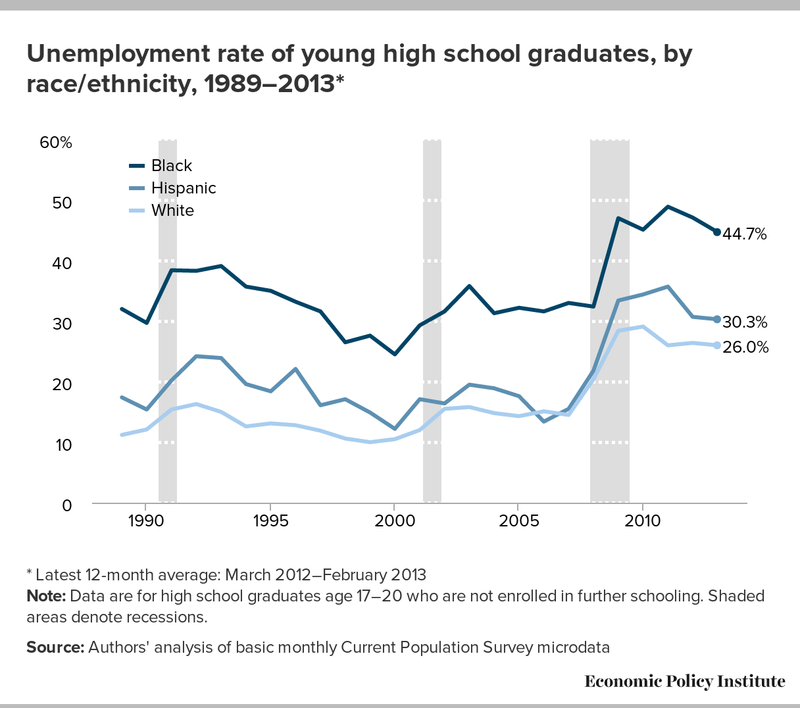 Figure C shows that among young high school graduates, the unemployment rate of racial and ethnic minorities—particularly young black graduates—tends to be higher than that of whites, in good times and bad. In 2007, the unemployment rate of young white high school graduates age 17–20 who are not enrolled in further schooling was 14.5 percent. It rose to 29.1 percent in 2010 and has since improved slightly to an average of 26.0 percent over the last year (March 2012–February 2013). 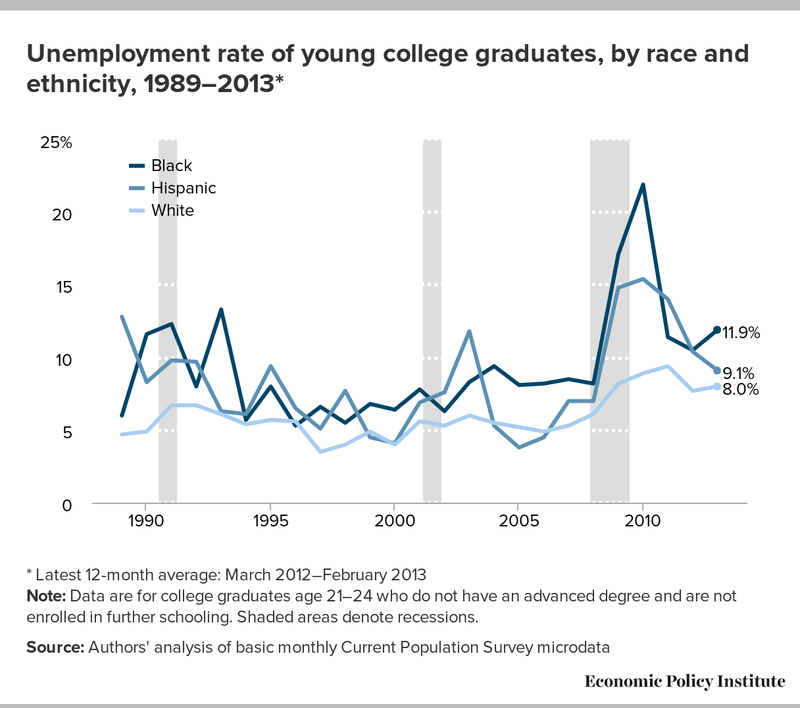 In 2007, the unemployment rate of young black high school graduates was 33.0 percent. It continued on a general upward trend until 2011, when it was 48.9 percent, and has since declined only slightly, to 44.7 percent over the last year. In 2007, the unemployment rate of young Hispanic high school graduates was 15.5 percent. That rate also rose until 2011, when it was 35.7 percent, and has since improved modestly to 30.3 percent. Because the definition of unemployment includes only jobless workers who report that they are actively seeking work, the unemployment rate overlooks those who are “underemployed”: jobless workers who want a job but have given up looking, and workers who have a job but cannot get the hours they want or need. Figure D presents national data on both unemployment and underemployment among young high school graduates (those age 17–20 who are not enrolled in further schooling), providing a more comprehensive look at labor market slack. Underemployment rates include workers who are unemployed, those who work part time but want full-time work (“involuntary” part timers), and those who want a job and have looked for work in the last year but have given up actively seeking work (“marginally attached” workers). Note: Underemployment data are only available beginning in 1994. 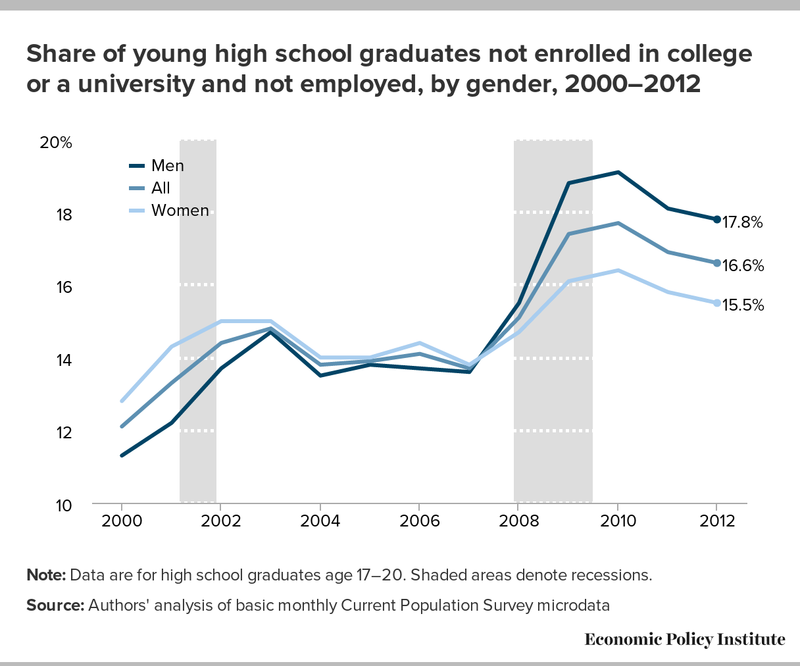 Data are for high school graduates age 17–20 who are not enrolled in further schooling. Shaded areas denote recessions. Currently, while the unemployment rate of young high school graduates is 29.9 percent, their underemployment rate is over 50 percent (51.5 percent). In other words, in addition to the officially unemployed, a significant share of young people either want a job but have simply given up looking for work, or have a job that does not provide the hours they need. While state breakdowns of underemployment by educational attainment are not available, Appendix Table A2 shows state-level underemployment rates of all workers by age. Educational opportunity is often identified as a possible silver lining to the dark cloud of unemployment that looms over today’s young people. The assumption is that a lack of job opportunities propels young workers to “shelter” from the downturn by attaining additional schooling, which may improve their long-run career prospects. However, there is no evidence of an uptick in enrollment due to the Great Recession. Figure E shows the share of young high school graduates (age 17–20) enrolled in college or a university. This share has greatly increased over time (from 44.0 percent in 1989 to 59.7 percent in 2012), with particularly steep increases for women (44.6 percent to 63.6 percent) compared with men (43.4 percent to 55.6 percent). Notably, although the overall enrollment rate has risen since the start of the Great Recession in 2007, the increase is not a departure from the longer-term trend. For reference, the dotted lines show the linear trend based on 1989–2007 data. The dotted lines after 2007 thus show what enrollment rates would have been had they simply continued their long-run trend. 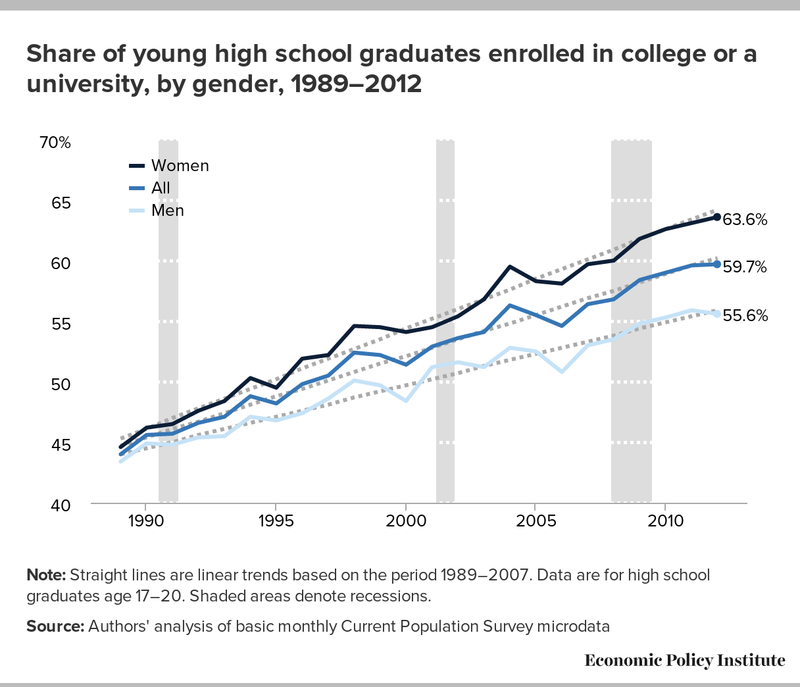 Enrollment since the start of the Great Recession has continued to grow at its long-run pace, with no meaningful departure from that trend for either men or women. Note: Straight lines are linear trends based on the period 1989–2007. Data are for high school graduates age 17–20. Shaded areas denote recessions. It is also worth mentioning that while the enrollment rates in Figure E are for high school graduates between age 17 and 20, the same conclusions hold true when analyzing enrollment data for all high school graduates under age 25; since the start of the Great Recession, college and university enrollment rates have not meaningfully departed from their long-term trend for either men or women. Appendix Figure AA shows enrollment rates of high school graduates under age 25 at the national level, and Appendix Table A3 shows enrollment rates by state of high school graduates under age 25. That enrollment has not increased above its long-run trend despite the lack of job opportunities in the Great Recession and its aftermath is likely due largely to an often-overlooked fact: Students and workers are not two distinct groups. Many students must work to pay for school or cover living expenses. In 2007, before the recession began, more than half (51.2 percent) of college students under age 25 were employed. By 2012, the share had dropped to 45.4 percent. For students who must work to afford school, but cannot find work due to the poor labor market, “sheltering in school” is not an option. In this downturn, certainly some students have had the financial resources to take shelter in school. However, the lack of a substantial increase in enrollment suggests this group has been offset by students who have been forced to drop out of school, or who never enter, because a lack of work meant they could not afford to attend. The lack of a Great Recession–fueled increase in college or university enrollment, combined with the lack of job prospects, means a large share of young high school graduates are now “disconnected”—that is, neither enrolled nor employed (Figure F). In 2007, 13.7 percent of young high school graduates were neither enrolled nor employed, and that share spiked to 17.7 percent in 2010. It has since declined slightly, to an average of 16.6 percent in 2012. 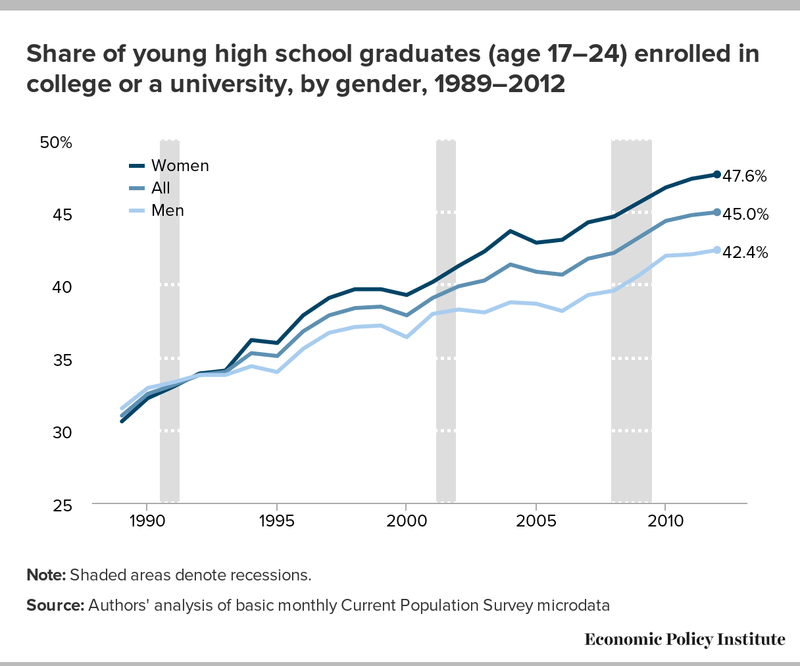 The increase was larger for young male high school graduates (from 13.6 percent in 2007 to 19.1 percent in 2010 to 17.8 percent in 2012) than young female high school graduates (from 13.8 percent in 2007 to 16.4 percent in 2010 to 15.5 percent in 2012). The increase in the share of “disconnected” young people represents an enormous loss of opportunities for this young cohort, as the lack of work experience and education will have a lasting negative impact on their lifetime earnings. The long-term scarring effects of the Great Recession and its aftermath on young graduates are discussed in depth later in this paper. Note: Data are for high school graduates age 17–20. Shaded areas denote recessions. By attending and graduating from college, young college graduates have made a significant down payment on their career in terms of both time and money, and they typically have very high labor force participation. And because a college degree affords more opportunities in the labor market—not least of which is the fact that college graduates are often more competitive relative to non–college graduates when it comes to landing jobs not requiring a college degree—unemployment among young workers with a college degree is substantially lower than among other young workers. However, young college graduates’ job prospects have deteriorated dramatically since the start of the Great Recession. In this section we examine the labor market outcomes of college graduates between age 21 and 24 who do not have an advanced degree and are not enrolled in additional education. Figure G shows that the unemployment rate of young college graduates jumped from 5.7 percent in 2007 to 10.4 percent in 2010, dwarfing the increases in prior recessions. It has since declined slightly, to an average of 8.8 percent over the last year (March 2012–February 2013). Since the unemployment rate of young college graduates remains significantly elevated, the Class of 2013 will join a sizable backlog of unemployed college graduates from the classes of 2009, 2010, 2011, and 2012 in an extremely difficult job market. Note: Data are for college graduates age 21–24 who do not have an advanced degree and are not enrolled in further schooling. Shaded areas denote recessions. 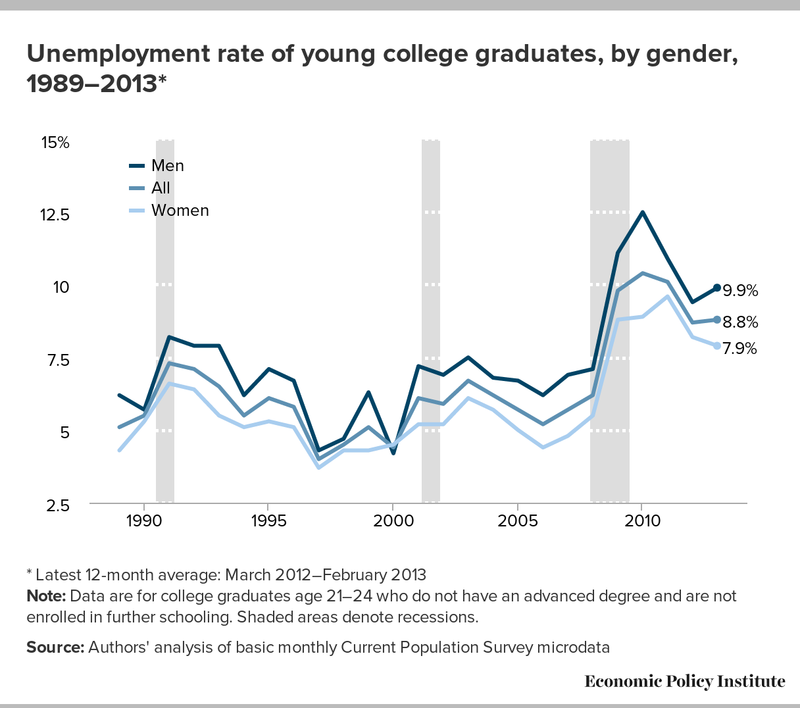 Unemployment data by gender, though somewhat volatile due to relatively small sample sizes, show that the increase in unemployment was larger for young male college graduates (from 6.9 percent in 2007 to a peak of 12.5 percent in 2010) than young female college graduates (from 4.8 percent in 2007 to a peak of 9.6 percent in 2011). The unemployment rate of young male college graduates was 9.9 percent over the last year (March 2012–February 2013), compared with 7.9 percent for young female college graduates. This gender gap in unemployment is likely due largely to industry concentration; women are more likely to be employed in industries, such as health and education, that are less sensitive to downturns. Figure H shows unemployment rates by race and ethnicity of college graduates age 21–24 who are not enrolled in further schooling. As was the case with gender, the data by race and ethnicity are volatile due to relatively small sample sizes. Nevertheless, the unemployment rate of young college graduates who are racial and ethnic minorities clearly tends to be higher than that of young white college graduates, in good times and bad. The unemployment rate of young black college graduates was 8.5 percent in 2007, rose to 21.9 percent by 2010, and improved to 11.9 percent over the last year (March 2012–February 2013). The unemployment rate of young Hispanic college graduates was 7.0 percent in 2007, rose to 15.4 percent by 2010, and improved to 9.1 percent over the last year. Among young white college graduates, the unemployment rate was 5.3 percent in 2007, rose to 9.4 percent in 2011, and improved to an average of 8.0 percent over the last year. Arguably, there should be little disparity in the unemployment rates of young college graduates, who have the same basic degree and are in the same labor market position (i.e., college graduates, age 21–24, not enrolled in school, and either employed or actively seeking work). It is notable that having an equivalent amount of higher education and a virtual blank slate of prior work experience still does not generate parity in unemployment across races and ethnicities. This suggests other factors may be at play, such as minorities not having equal access to the informal professional networks that often lead to job opportunities, and/or discrimination against racial and ethnic minorities. Figure I presents unemployment and underemployment data for young college graduates age 21–24 who are not enrolled in further schooling. Currently, while the unemployment rate of this group is 8.8 percent, the underemployment rate is more than twice that, at 18.3 percent. In other words, in addition to the substantial share who are officially unemployed, a large swath of these young, highly educated workers either have a job but cannot attain the hours they need, or want a job but have given up looking for work. Note: Underemployment data are only available beginning in 1994. Data are for college graduates age 21–24 who do not have an advanced degree and are not enrolled in further schooling. Shaded areas denote recessions. Although the measure of underemployment used in Figure I includes hours-based underemployment (i.e., part-time workers who want full-time work), it does not include “skills/education–based” underemployment (e.g., the young college graduate working as a barista). Economist Andrew Sum offers insight into skills/education–based underemployment by categorizing occupations according to whether the U.S. Department of Labor, Employment and Training Administration’s O*NET system characterizes them as requiring a four-year college degree. First, it is important to note that even in good economic times, a surprisingly high share of young college graduates work in jobs that do not require their college degree. For example, Sum (2013) finds that in 2000—when jobs were plentiful and the unemployment rate was 4.0 percent—40 percent of employed college graduates under age 25 worked in jobs not requiring a college degree. However, the share of young college graduates working in jobs not requiring a college degree increased over the 2000–2007 business cycle, increased further in the Great Recession, and has not yet begun to improve. Sum (2013) finds that in 2007, 47 percent of employed college graduates under age 25 were not working in jobs requiring a college degree, and that this share increased to 52 percent by 2012. This increase underscores that today’s unemployment crisis among young workers did not arise because these young adults lack the right education or skills. Rather, it stems from weak demand for goods and services, which makes it unnecessary for employers to significantly ramp up hiring. Later (in the section Downturn affects young workers’ futures) we discuss how the fact that young workers entering the labor market in a downturn are more likely to have to settle for lower-level jobs contributes to the severe and long-lasting negative impact on earnings of starting out when the economy is weak. Figure J presents average hourly wages of young high school graduates (age 17–20) and young college graduates (age 21–24) who are not enrolled in further schooling; the underlying data for key years are provided in Table 1. On average, young high school graduates in 2012 had an hourly wage of $9.48, yielding an annual income of roughly $19,700 for a full-time, full-year worker. Young college graduates had an average hourly wage of $16.60, which translates into an annual income of roughly $34,500 for a full-time, full-year worker. On average, wages of young female graduates remain far less than those of young male graduates, regardless of educational attainment. Among young high school graduates, women earn 13.4 percent less than men, while among young college graduates, women earn 12.2 percent less than men. Note: Data are for college graduates age 21–24 who do not have an advanced degree and are not enrolled in further schooling, and high school graduates age 17–20 who are not enrolled in further schooling. Shaded areas denote recessions. Note: Data are for college graduates age 21–24 who do not have an advanced degree and are not enrolled in further schooling, and high school graduates age 17–20 who are not enrolled in further schooling. The wages of all groups of young graduates have fared extremely poorly during the Great Recession and its aftermath, as shown in Table 1. The wages of young high school graduates dropped 11.7 percent (12.9 percent for men and 9.9 percent for women) between 2007 and 2012. The wages of young college graduates dropped 7.6 percent (9.4 percent for men and 6.6 percent for women) over the same period. As Figure J shows, however, the wages of young graduates fared poorly even before the Great Recession began; they saw no growth over the entire period of general wage stagnation that began during the business cycle of 2000–2007. Between 2000 and 2012, the wages of young high school graduates declined 12.7 percent (13.3 percent for men and 12.5 percent for women), and the wages of young college graduates decreased 8.5 percent (6.1 percent for men and 10.9 percent for women). These drops translate into substantial amounts of money. 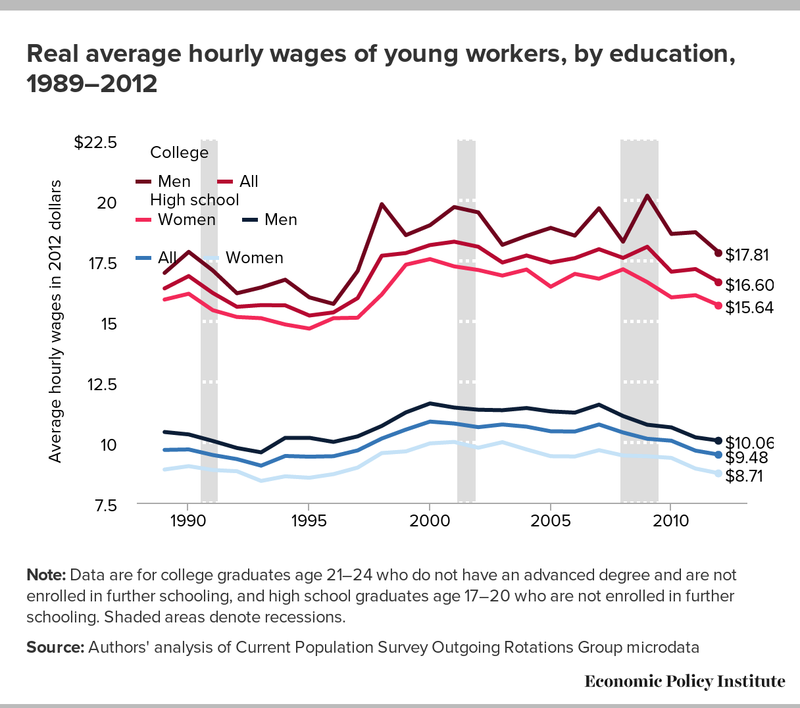 For full-time, full-year workers, the hourly wage declines from 2000 to 2012 represent a roughly $2,900 decline in annual earnings for young high school graduates and a roughly $3,200 decline for young college graduates. The wage declines since 2000 stand in sharp contrast to the strong wage growth for these groups from 1995 to 2000. During that period of low unemployment and strong overall wage growth, wages rose 15.4 percent for young high school graduates and 19.1 percent for young college graduates. The stark difference between these two economic periods illustrates how the wages of young graduates vary considerably depending on whether the overall economy is experiencing low unemployment and strong wage growth, or high unemployment and wage stagnation. Young graduates who enter the labor market during periods of strength (e.g., 1995–2000) face much stronger wage prospects than young graduates who enter the labor market during periods of weakness (e.g., 2001 to the present). The erosion of job quality for young graduates is also evidenced by their declining likelihood of receiving employer-provided health insurance or pensions. In particular, we focus here on whether these entry-level workers receive these benefits from their own employers (in the section Weak safety net for young workers, we discuss the impact on health insurance coverage of the provision of the Patient Protection and Affordable Care Act of 2010 that allows adults under age 26 to remain on their parents’ employer-sponsored health insurance). 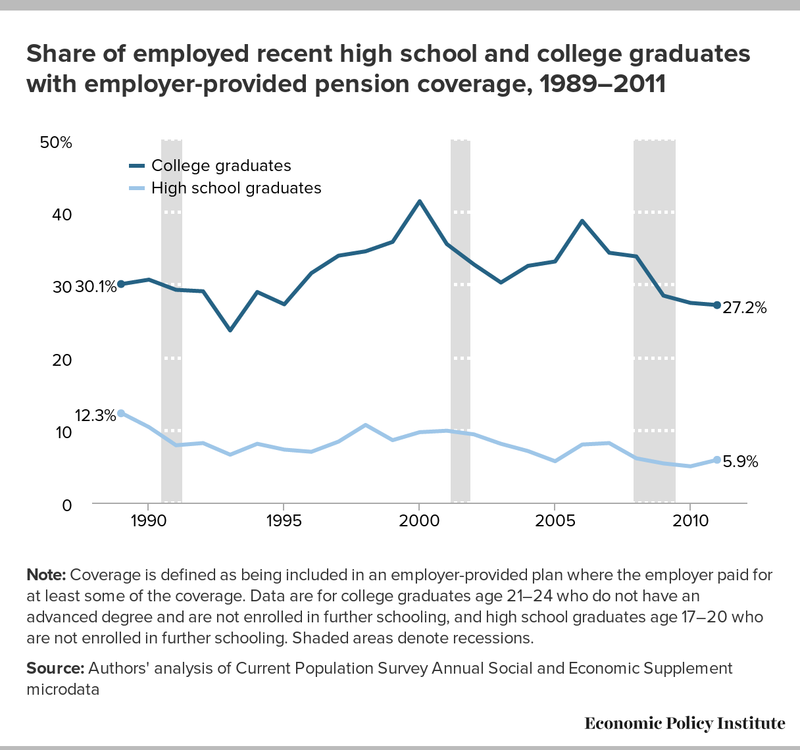 Figure K presents the share of employed young graduates who receive health insurance coverage from their own employer. In 1989, almost a quarter (23.5 percent) of new high school graduates (age 17–20) with jobs had health insurance through their workplace, as did well over half (60.1 percent) of employed new college graduates (age 21–24). These numbers have since declined dramatically. In 2011, the most recent data available, just 7.1 percent of employed new high school graduates and less than a third (31.1 percent) of employed new college graduates received health insurance through their job. Note: Coverage is defined as being included in an employer-provided plan where the employer paid for at least some of the coverage. Data are for college graduates age 21–24 who do not have an advanced degree and are not enrolled in further schooling, and high school graduates age 17–20 who are not enrolled in further schooling. Shaded areas denote recessions. 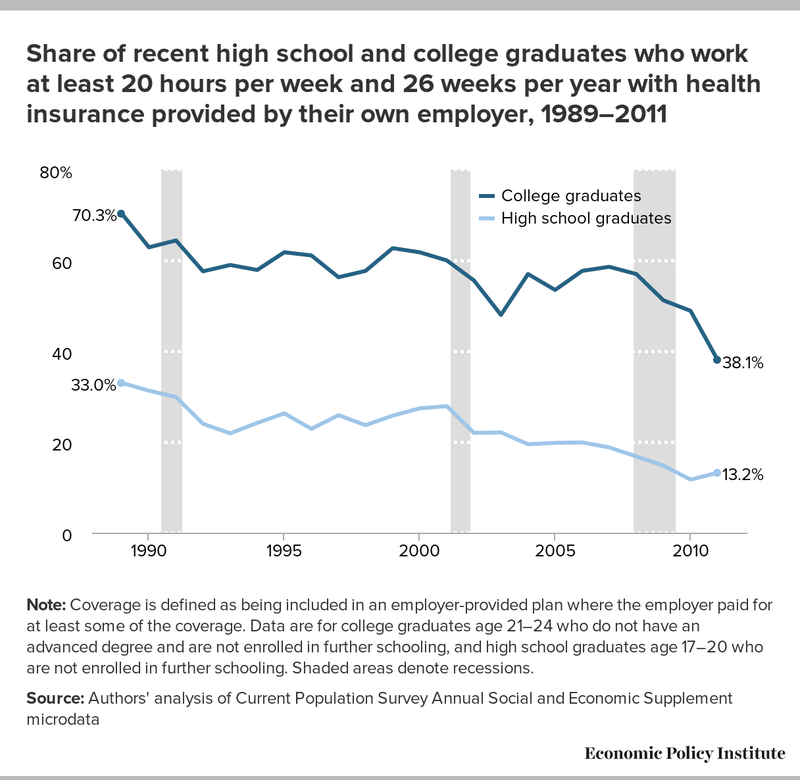 That employer-provided health insurance coverage is much higher among new college graduates than new high school graduates reminds us that completing college can result in significant economic benefits. But the fact that health insurance coverage is increasingly less likely to be provided to entry-level college graduates tells us that job quality among college graduates, too, is deteriorating. After wages, employer-provided health insurance coverage is perhaps the single best indicator to workers of whether they have a good-quality job. This dramatic erosion of health coverage among new graduates—both new high school graduates and new college graduates—is a telling indicator of their loss of good jobs over the last two decades. Figure L shows that the share of employed young graduates who receive pension coverage from their own employer (either defined-benefit or defined-contribution) fell over this period as well. In 1989, just 12.3 percent of new high school graduates (age 17–20) with jobs had a pension through their workplace, and that share fell even further to 5.9 percent by 2011. Pension coverage among new college graduates (age 21–24) increased from 30.1 percent to 41.5 percent between 1989 and 2000, presumably because of increased participation in defined-contribution plans. However, this group’s pension coverage fell from 41.5 percent in 2000 to 27.2 percent in 2011. This sharp reduction in pension benefits for young college graduates over the last decade indicates a substantial job quality problem even for those with high educational attainment. To isolate trends in benefits received by new graduates who work relatively full schedules, Appendix Figure AB and Appendix Figure AC show employer-provided health insurance and pension coverage for new graduates who work 20 hours or more per week and at least 26 weeks per year (as distinct from figures K and L, which show employer-provided health insurance and pension coverage for all employed new graduates, regardless of how many hours per week or weeks per year they work). Unsurprisingly, workers with fuller schedules are somewhat more likely to have employer-provided health insurance and pension coverage. The differences are not dramatic, however, and the trends are very similar to those for all employed new graduates, indicating that employer-provided benefits have been reduced regardless of full- or part-time work status. While finding a stable job is important for workers of all ages, it is nevertheless true that one way many workers gain advancement is by leaving one job and taking another that offers better pay or opportunities. This is particularly true for young workers, who are more likely to be in the process of identifying their own abilities and interests and tend to change jobs more frequently than older workers as they search for a job that is a good match and that either pays more or has better potential for wage growth. One measure of such opportunities for advancement is the number of voluntary quits throughout the workforce. All else equal, a larger number of people voluntarily quitting jobs indicates a labor market in which job opportunities are plentiful and employed workers have the flexibility to look for jobs that pay better and more closely match their skills and interests. During downturns, the number of voluntary quits falls as outside job opportunities become scarce. While the low level of voluntary quits represents lost opportunities for workers of all ages, it illustrates a critical loss of opportunities for young workers, because they in particular often benefit from leaving one job and moving onto another that is a better fit. Think, for example, of a young person who was lucky enough to graduate and find a job in 2007, the last spring graduation before the Great Recession began. Under normal circumstances that young person may have benefited at some point in the last six years from leaving her job for one that was a better match or offered better pay. Instead, she may have been unable to change jobs because of the lack of outside job opportunities. Data on voluntary quits are not available by age, so Figure M simply presents the total number of voluntary quits over time. Between 2007 and 2009, the average number of voluntary quits dropped by around 40 percent, from 2.9 million per month to 1.8 million per month. 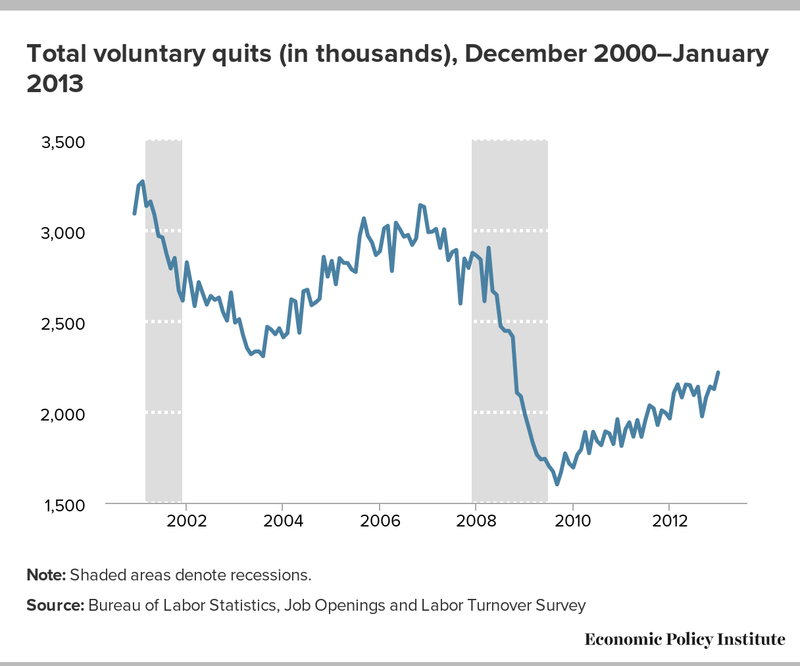 The voluntary quit level has picked up somewhat since that time, but by early 2013 it was still more than 20 percent below its 2007 level. This represents millions of lost opportunities for young workers, and is one of the factors underlying their wage declines since 2007. Young workers who have the bad luck to enter the labor market during a downturn not only have worse outcomes in the short run than if they had entered in a healthy labor market; these negative effects can last a very long time. Research shows that entering the labor market in a severe downturn can lead to reduced earnings, greater earnings instability, and more spells of unemployment over the next 10 to 15 years. Unsurprisingly, given the data presented earlier on underemployment, the evidence suggests that part of the decline in earnings is due to the fact that young workers entering the labor market in a downturn often have to settle for jobs at less-attractive employers or in lower-level occupations than they otherwise would have (this is often referred to as “cyclical downgrading”). This initial effect does tend to fade over time as workers find better jobs or move up within their companies, but that process can take well over a decade. In short, the labor market consequences of graduating in a bad economy are not just large and negative, but also long-lasting (Oreopolous, von Wachter, and Heisz 2012; Kahn 2010). Though there has been some improvement over the last year, job prospects remain dim. Thus, the Class of 2013 will be the fifth consecutive graduating class to enter the labor market during a period of profound weakness. The evidence suggests that because of their unlucky timing—in other words, through absolutely no fault of their own—this cohort is very likely to fare poorly for at least the next decade. 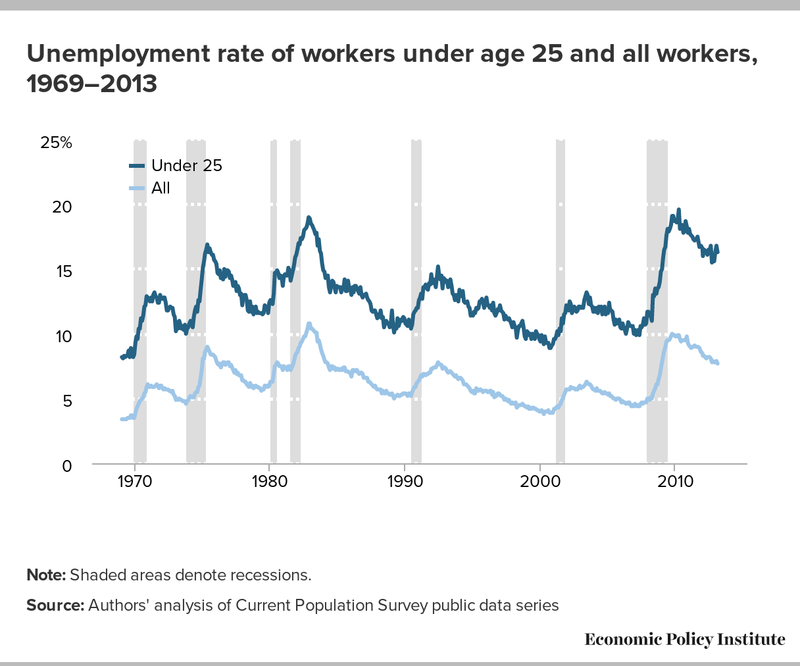 As previously demonstrated, the unemployment rates of young workers are significantly higher than before the recession began. Without jobs or the benefits that often accompany employment, what safety net exists for new entrants to the labor market who are unemployed? Many federal and state assistance programs that comprise the safety net for unemployed and underemployed workers are not available to young people who have little or no work experience. Unemployment Insurance (UI), the primary safety net for workers who are laid off through no fault of their own, helps the unemployed make ends meet until they can find another job. Young workers are often ineligible for this program, however, because they must first meet state wage and work minimums during an established reference period. Young workers often fail to meet these eligibility requirements due to their more intermittent attachment to the labor market and the fact that many are entering the labor market for the first time. Temporary Assistance for Needy Families (TANF) program benefits have work requirements and are only available to individuals with children, which excludes most young graduates. The Supplemental Nutrition Assistance Program (SNAP), which is responsible for distributing food stamps, is offered to young adults without work experience or dependents. However, if they are not currently working or participating in a work-training program, benefits are generally only available for three months in a 36-month period. The Earned Income Tax Credit (EITC), a refundable federal income tax credit for low- to moderate-income individuals, also requires work experience. The Patient Protection and Affordable Care Act (PPACA), enacted in 2010, expanded health insurance options by allowing adults under age 26 to remain on their parents’ employer-sponsored health insurance policy. Gould (2012) showed that this provision has improved rates of health insurance coverage for adults age 19–25. However, it should be noted that young adults whose parents do not have employer-sponsored health insurance (disproportionately non-whites and/or those with less education and/or lower incomes and/or who are unemployed) are unable to take advantage of this provision. Though PPACA has made positive strides in providing some protections for some young graduates facing an especially harsh labor market, young workers do not have a strong public safety net to fall back on, even in times of persistent high unemployment. Therefore, many new graduates turn to their families for assistance. In 2012, for example, 56.5 percent of 18- to 24-year-olds were living with their parents, an increase of 5.3 percentage points since 2007 (CPS ASEC, Table AD-1). This trend may be burdensome to parents, many of whom may have also been hit hard by the recession, facing job loss; hour reductions; and/or the loss of their home, home equity, or retirement savings. Unfortunately for many young workers, family and friends are the only safety net available in a labor market with severely limited opportunities. The high cost of college is one likely reason that college and university enrollment rates have not increased above their long-run trend despite the lack of job opportunities during the Great Recession and its aftermath. In the 2012–2013 school year, the total cost of attendance for an on-campus student—including in-state tuition, books, room and board, and transportation expenses—at a four-year in-state public school averaged $22,261. For a four-year private school, it was $43,289. The cost of higher education has risen faster than family incomes, making it harder for families to pay for college. From the 1982–1983 enrollment year to the 2011–2012 enrollment year, the inflation-adjusted cost of a four-year education, including tuition, fees, and room and board, increased 130.0 percent for private school and 131.4 percent for public school. Median family income only increased 10.9 percent over this period, leaving families and students unable to pay for most colleges and universities in full (College Board 2012). As tuition costs have risen at rates vastly exceeding income growth, it is not surprising that many students have to take on debt to pay for college. In 2010, about one in five of the nation’s households owed money on student debt, a proportion that has more than doubled since 1989. For households with student loan debt, the average amount was $26,682 in 2010, and the median was $13,410. The average amount, which has nearly tripled since 1989, is higher than the median because of high amounts of debt at the top: 10 percent of households owe $61,895 or more (Fry 2012). Most Class of 2013 college graduates enrolled in college four years ago, in the immediate aftermath of the Great Recession, when the labor market was still deteriorating. During the time they were in college, it is likely that many of their families faced real income declines due to job loss, hour reductions, or lack of wage growth. At the same time, higher education costs increased to make up for asset losses (at private universities) and funding cuts (at public universities). For example, between the 2007–2008 school year and the 2012–2013 school year, state appropriations for higher education per full-time enrolled student fell by 27.7 percent, and in response, public colleges and universities have had to steeply increase tuition (Oliff et al. 2013). The share of Class of 2013 graduates with large student loans has likely risen accordingly. In taking on these loans, students often do not realize that upon graduation they may not find a job providing the income needed to repay the loans. And although most student loans have a grace period of six months before payments are expected, recent graduates who do not find a stable income source may be forced to miss a payment or default altogether on their loans. Default can ruin young workers’ credit scores and set them back years when it comes to saving for a house or a car. Researchers at the Federal Reserve Bank of New York find that more than 30 percent of student loan borrowers who are not in deferment or forbearance were at least 90 days past due on their educational debt in the fourth quarter of 2012 (Brown et al. 2013). These same researchers find that the recent growth in student loan balances and delinquencies was accompanied by a decrease in mortgage and auto loan borrowing for younger age groups, suggesting that student loan debt is indeed crowding out other investments. One contributing factor to these exceptionally high delinquency rates may be risky loans from private banks that graduates took on while in school. To counteract riskier private loans, Congress passed the Student Aid and Fiscal Responsibility Act in 2010 (as part of the Health Care and Education Reconciliation Act) to end private lending of federally subsidized loans and expand federal Pell Grants. Another current issue in student debt policy relates to the fact that the College Cost Reduction and Access Act of 2007 lowered rates on subsidized Stafford loans from 6.8 percent to 3.4 percent, for four academic years. Last year, Congress extended the lower rate for the 2012–2013 academic year. If Congress does not again extend the lower rate, new loans made after June 30 will revert to the 6.8 percent rate, doubling the current interest rate. Although the job situation is slowly improving, the Class of 2013 faces an extremely difficult job market. The dramatic increase since 2007 in unemployment among new college graduates in particular underscores that today’s unemployment crisis among young workers did not arise because workers lack the right skills. Instead, the Class of 2013 is one of the many casualties of weak demand for workers in the overall economy. Continued improvement in the labor market is expected to be slow, with the overall unemployment rate unlikely to fall below 6 percent for another three years. (As a reminder of what a healthy unemployment rate looks like, consider that in spring 2007 the unemployment rate was 4.4 percent.) Given that the unemployment rate of young workers generally parallels the overall unemployment rate but at a much higher level—recall Figure A—improvement in the unemployment rate of young workers is also expected to be slow. Thus, the classes of 2014, 2015, and 2016 will likely also face the negative consequences of entering the labor market during a period of very high unemployment. It doesn’t have to be this way. Although young workers are a unique group, their current high unemployment does not have a solution unique to them. The one and only thing that will quickly bring down the unemployment rate of young workers is strong job growth overall. Policymakers may be focused on deficit reduction, but that focus is misguided and harmful (see Bivens, Fieldhouse, and Shierholz 2013). Focusing on policies that will generate demand for U.S. goods and services (and therefore demand for workers who provide them)—policies such as fiscal relief to states, substantial additional investment in infrastructure, expanded safety net measures, and direct job creation programs in communities particularly hard-hit by unemployment—is the key to giving young people a fighting chance as they enter the labor market during the aftermath of the Great Recession. — Heidi Shierholz joined the Economic Policy Institute as an economist in 2007. She conducts research on employment, unemployment, and labor force participation; the wage, income, and wealth distributions; the labor market outcomes of young workers; unemployment insurance; the minimum wage; and the effect of immigration on wages in the U.S. labor market. She previously worked as an assistant professor of economics at the University of Toronto, and she holds a Ph.D. in economics from the University of Michigan-Ann Arbor. — Natalie Sabadish is a research assistant at the Economic Policy Institute, providing support to EPI’s economists in a variety of policy areas. She also works with the Economic Analysis and Research Network (EARN), answering data-related inquiries and coordinating a nationwide internship program. She has previously interned at the Delaware Department of Labor and the Keystone Research Center. She has a B.S. in economics from the University of Delaware. — Nicholas Finio is a research assistant at the Economic Policy Institute. He provides research assistance to EPI’s economists on a variety of topics, including health insurance, wages and living standards, macroeconomics, and the labor market. His areas of interest and research include wage inequality and the labor market. He has a B.A. in economics from Gettysburg College. — The authors would like to thank Kathryn Edwards and Hilary Wething, coauthors of earlier editions in this series whose ideas helped shape this paper. Current Population Survey public data series. Various years. Aggregate data from basic monthly CPS microdata are available from the Bureau of Labor Statistics through three primary channels: as Historical ‘A’ Tables released with the BLS Employment Situation Summary (http://www.bls.gov/data/#historical-tables), through the Labor Force Statistics database (http://www.bls.gov/cps/#data), and through series reports (http://data.bls.gov/cgi-bin/srgate). Kahn, Lisa B. 2010. “The Long-Term Labor Market Consequences of Graduating from College in a Bad Economy.” Labour Economics, vol. 17, no. 2. Oreopolous, Philip, Till von Wachter, and Andrew Heisz. 2012. “Short- and Long-Term Career Effects of Graduating in a Recession.” American Economic Journal: Applied Economics, vol. 4, no. 1, pp 1–29. Sum, Andrew. 2013 (forthcoming). The Labor Market Fortunes of America’s Young Bachelor’s Degree Holders. Center for Labor Market Studies at Northeastern University.